Russia, 1953. When Stalin (McLoughlin) suddenly dies, his subordinates scramble to be the one to take his place. Cue paranoia and plotting as Khrushchev (Buscemi), Molotov (Palin), Zhukov (Isaacs) and more aim to land on top and stay alive. 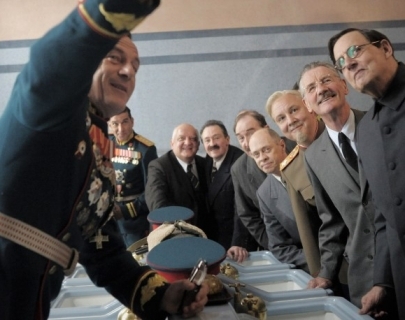 Master political satirist, Armando Iannucci (The Thick Of It, Veep), turns his attention to communist Russia and one of the darkest chapters in recent history, with hilarious results and not a Russian accent to be heard. Please note, the trailer below contains language some people may find offensive.